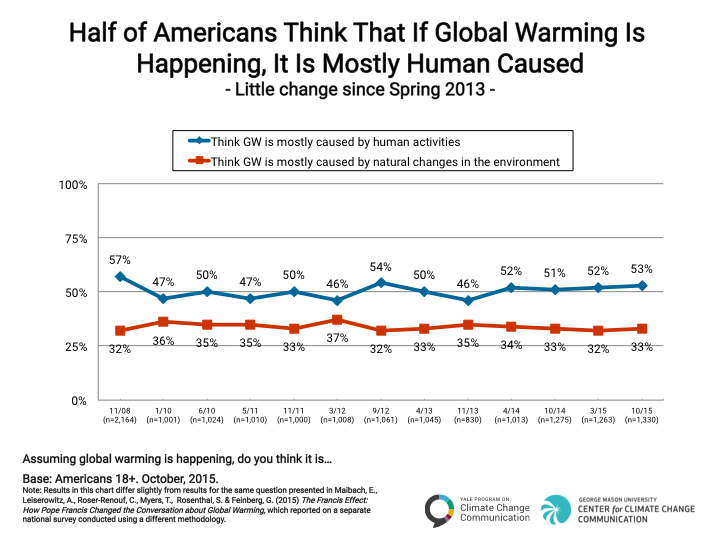 Nearly two-thirds of the American public (63%) currently think global warming is happening, a percentage that has remained relatively stable over the past five years. Similarly, the percentage of the public who think that if global warming is happening, it is mostly human caused (52%) has also remained relatively unchanged. One reason these numbers have been stable in recent years may be because most Americans are simply not hearing or talking about the issue. 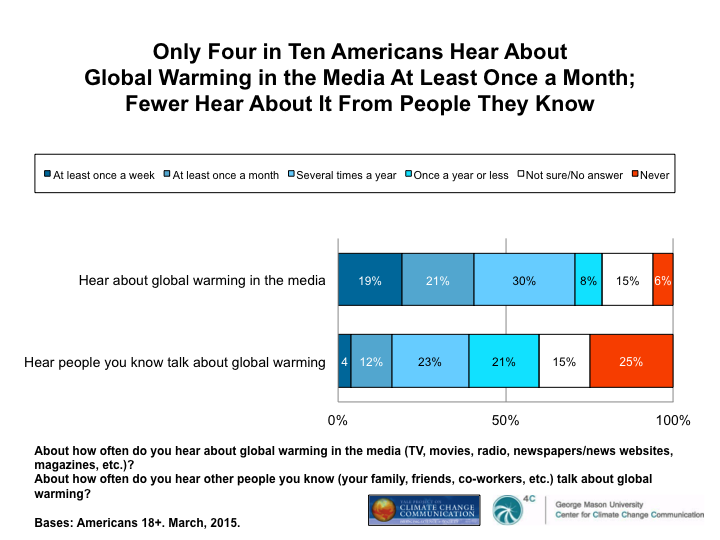 Our survey finds, for example, that only 40% of the American public says they hear about global warming in the media at least once a month and only 19% hear about it at least once a week. Further, only 16% say that they hear people they know talk about global warming at least once a month, with only 4% reporting they hear other people talking about it at least once a week. 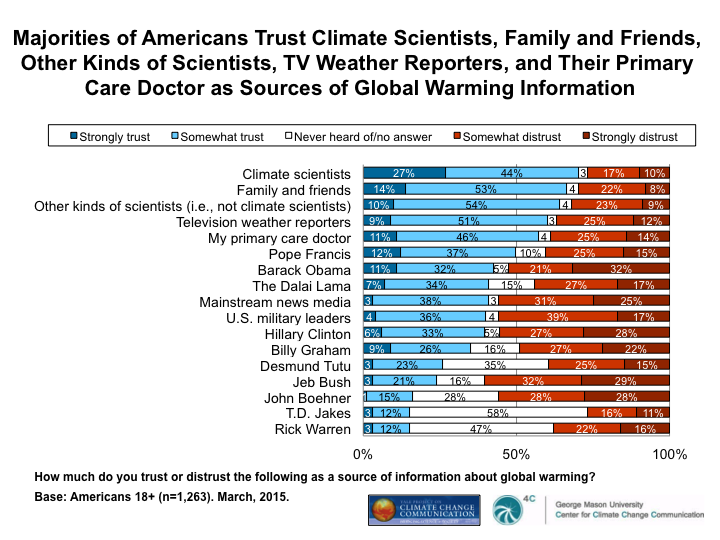 However, the survey also finds that Americans trust a number of potential sources of information about global warming, including climate scientists (70% of the public trusts them for information), family and friends (67%), other kinds of scientists (64%), and TV weather reporters (60%). Half of Americans (50%) also trust Pope Francis as a source of information about global warming – which is potentially important given that the Pope is preparing a major statement (an encyclical) about the religious and moral dimensions of climate change (for more information, please see our recent report, Climate Change in the American Christian Mind. This report, Climate Change in the American Mind: March 2015, includes an executive summary, and sections on Americans’ global warming beliefs and attitudes, risk perceptions, policy support, and moral and religious responses to the issue.